Grand Excursion Preview  Reads Landing, Minn., to Bay City, Wis. Subscribe now to Big River. Reads Landing, Minn., to Bay City, Wis. The Chippewa River flows down from northwestern Wisconsin through miles of sand and pines. When it joins the Mississippi, across the river from Reads Landing, Minn., it drops its burden of sand to form a narrow spot in the river, like a plug in a bathtub. Lake Pepin is the bathtub. Two miles wide and 21 miles long, Lake Pepin is a grand and breathtaking band of blue with a wall of stone along its eastern shore. Father Louis Hennepin was the first white explorer to see the lake and called it the Lake of Tears. Later, other French explorers dubbed it Pepin after Pepin the Short, father of Charlemagne. Perhaps the earliest European outpost on Lake Pepin was Fort St. Antoine. French trader Nicholas Perrot built it in 1686, just south of present day Stockholm, Wis., to establish a fur trade with the Dakota Indians. In 1847 Charles Read, a former British soldier, purchased an Indian trading post at the mouth of the Chippewa to found Reads Landing. From the 1860s to the early 1890s Reads Landing was a rollicking lumberjack town. Logs that were floated down the Chippewa River kept hundreds of men busy, and the men kept over a dozen saloons busy. The logs were built into rafts and floated downstream to sawmills. Today the quiet village is home to about 200 people. The town of Pepin, Wis., (pop. 878) was first settled in the mid 1840s and soon became a bustling village with a school and stores. Its most famous resident, author Laura Ingalls Wilder, was born near there in the 1860s. The Ingalls crossed the Mississippi on the ice of Lake Pepin when they headed west. The lake is one of the last places on the river where thick ice can be found in spring. The town of Stockholm, not surprisingly, was settled by Swedes in the mid 1850s. It survived as many rivertowns did, on commercial fishing, clamming for buttons, and as a rail and steamboat center. Stockholm (pop. 97) is busier today than it has been in many years. Many artists keep shops in the towns historic buildings, making it a weekend destination. Maiden Rock, Wis., (pop. 121) bears the name of a bluff just downstream from the town. According to legend, a young Dakota maiden named We-no-nah (meaning first-born daughter), leaped to her death from the top of the bluff to avoid marrying a man she did not love. (In Mark Twains version of the story, she landed on her parents.) Similar legends are attached to cliffs and bluffs all over the country. Across the river, Lake City, Minn., (pop. 4,950) lays claim to being the birthplace of waterskiing, but today it is a popular harbor for sailboats. Any breezy summer day dozens of sailboats glide along the towns waterfront. Frontenac, Minn., just upstream from Lake City, is really two towns. Old Frontenac sits on the shore of the lake, and was a popular resort area in the 1880s. Frontenac, about a mile from the lake, stretches along the railroad tracks and U.S. Highway 61. Frontenac State Park occupies the bluff above the town, and is a great place for hiking and birding. 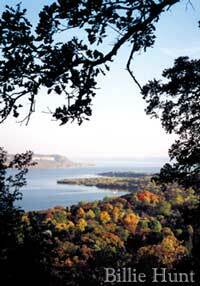 Bay City, Wis., and Wacouta, Minn., both sit at the top of Lake Pepin. Both used to be busy rivertowns with railroad stations, but now that the world has become a busier place, their principal attraction is the peace and natural beauty they offer. Bay City is a village of 465 with a beautiful city park on the lake and the River Bluffs History Center. A few blocks of homes on a small bluff overlooking the lake is all that remains of Wacouta, which once rivaled Red Wing for the honor of becoming the Goodhue County seat. Four of the paddlewheelers on the Grand Excursion passed through Lake Pepin at night lashed together to create one big party from four smaller ones. They were among the many excursion boats that plied Lake Pepin, which is also famous for high waves and sudden storms. An excursion boat bound for Red Wing, the Sea Wing, capsized in a violent thunderstorm near Lake City in July 1890, taking about 100 lives, mostly women and children.